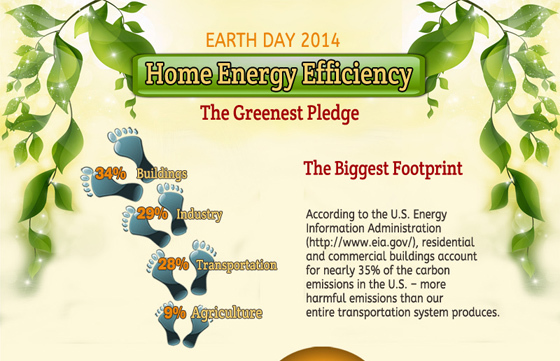 Thanks for visiting myHOMEscience to help celebrate Earth Day 2014! There are plenty of bigger, more-publicized places to go on this day devoted to saving our planet. But here at myHOMEscience, we’ve got an Earth-saving action plan with more impact than many of the eco-friendly activities covered on major news shows. 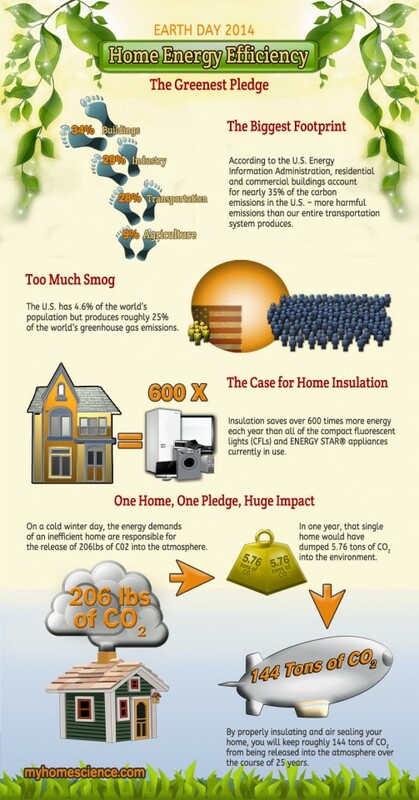 Yes, I’m talking about insulation –or more specifically, improving home insulation to reduce energy use and carbon emissions. According to the U.S. Energy Information Administration (http://www.eia.gov/), residential and commercial buildings account for nearly 35% of the carbon emissions in the U.S. –more harmful emissions than our entire transportation system produces. Building-related emissions result from fossil fuels burned to generate electricity or heat. Sure, our homes and work spaces need electricity and heat. But research done by the Dept. of Energy tells us that many buildings consume about twice as much energy as they should. This is bad news, but it’s also a big opportunity: We could cut carbon emissions in half by making our buildings more efficient. Now it’s time to talk about insulation. If we ever needed a wake-up call about the value of insulation, this winter was it. As the arctic cold front dipped down across the country, families who never worried about winter’s chill saw their pipes freeze and their heating bills climb to unprecedented highs. The financial penalty for a poorly insulated house corresponds directly to an environmental penalty, because of the extra electricity and heating fuel that must be consumed. We’ve all heard about saving energy by using ENERGY STAR® appliances and super-efficient light bulbs. But these devices eventually wear out and need to be replaced. Insulation NEVER wears out or requires any upkeep. The same can be said for the air-sealing upgrades that are recommended along with additional insulation. Making these complimentary “building envelope” improvements has proven to cut heating and cooling expenses by 50%. Of course, carbon emissions will also plummet if you dramatically lower the demand for heat & air conditioning. There are many ways to do the right thing for the environment at home –everything from recycling and using low-flow showerheads to limiting phantom loads and car pooling. But insulation and air sealing are the only improvements that will keep benefitting homeowners and the planet for as long as your house is standing. That’s a pretty powerful distinction. There are approximately 78.5 million single-family homes in the U.S. and most of them need air-sealing and insulation upgrades. This widespread inefficiency occurred because most of our housing stock was built when energy was cheap and the dangers of climate change were unknown. One major step towards permanently correcting this problem is to identify the weak points in a home’s building envelope (too little insulation, too much air leakage) and have qualified contractors “seal tight & insulate right,” using proven techniques and proper materials. If this sounds daunting, don’t worry. Today, many communities are being served by contractors who specialize in building envelope upgrades and other energy-saving improvements. Dr. Energy Saver is a leading example of this new breed of home improvement contractor. As you enjoy the positive energy evident in many Earth Day events around the world, I hope you’ll also think about the energy we can save with insulation –one of the best weapons we have to lower carbon emissions and protect our planet from the adverse effects of climate change.